You liked this post? This blog is deliberately ad-free, because only the content counts. If you want to show your appreciation for this post, share it wherever you want. And I am happy if you buy me a coffee! Why does the topic of committees move us as project managers? We need clear decisions for our projects in cases where our empowerment is not sufficient. Why is it often difficult to obtain these necessary decisions promptly, clearly and precisely? For this we have to understand that there are countless terms for one and the same … and many terms are used several times in practice. I will come to the typical problems with the committees that result from this later. Where can we find a solution? PMI braces role descriptions and organizational structure. So we cannot be helped here. Prince2 defines the mentioned committees in detail and harmoniously with IPMA or GPM. DIN 69901-5 defines the project board as a “superordinate body to which the project manager reports and which is available to him as a decision-making and escalation body”. This does not really help much. Then let’s see how the PM3 of the GPM supports us. What are steering committees? They can align the ship’s rudder in all directions on all seas. These steering committees are … internal and … cross-project. Patzak/Rattay defines steering committee, steering group and project advisory boards as synonyms. The task of this committee is to analyse, observe and control the selection of projects and the interrelationships between projects. 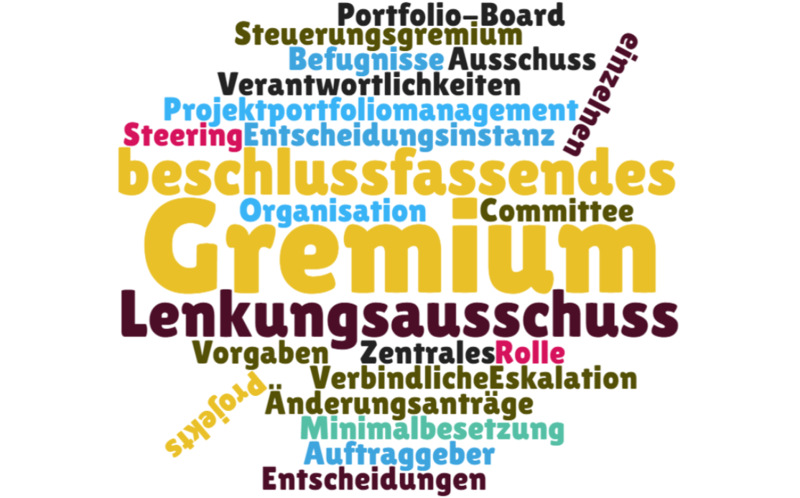 The project board is also very well defined in the Duden … in my opinion ….. Namely as the “Committee for Economic Steering”. In contrast to the steering committee, this is not about defining the general meaning of a project, but about economic observation and influence. The project board is therefore represented at the steering wheel in the car on specified roads and can decide which direction to take at which intersections. This committee, the steering committee, can also include external partners such as important suppliers or the end customer. possibly, if there is no separate change board, the decision of amendments. What do we as project and program managers have to do to be successfully supported by committees? Based on my experience I will explain the most important points. What prerequisites and knowledge are required in the steering committees? According to Patzak / Rattay, they must have transparency and knowledge about the corporate strategy and knowledge about the project portfolio. Otherwise, the steering committee or portfolio board cannot act sensibly. In order to be able to use the committees properly, we must observe a few basic rules. Children and managers have at least one thing in common. They can only remember 3 things. Always pay attention to formulate these core messages concisely and precisely, because since the year 2000 until today, the attention span with us humans has fallen from 12 to 8 seconds. Thanks to the new technology and the new lifestyle. Now I come to the typical problems that have already been announced. Experiences from my projects. Berlin. Public project. In public projects, it is often very difficult to separate the project client and the shareholders. Especially the governance organization becomes complex. Defining the requirements in such a construct is particularly difficult, as is managing changes. A “reinstatement” – this verb sounds already governmental or public – is preprogrammed here. South Africa. A project at an energy company with several divisions, which is to standardize central processes and IT systems. Due to the sheer size of the project, several external parties are required. In large-scale projects, the project offices are often staffed by external consulting companies to underline the challenging and neutral character. Even as the largest contractor, it can be difficult to formulate uniform committee definitions and appointments. Agreeing on maximum solution times for escalated problems at the respective escalation levels is often an impossibility, but critical to success. Israel. Again an energy company with several subsidiaries to harmonize their procurement organizations and processes. A further problem with the committee use is the decision fixation and above all the enforcement of decisions. In the run-up to committee meetings, pre-socialised decision alternatives and decisions are often questioned or not enforced again after the meeting has taken place. Here the cultural influence is formative and steering out. Decision making can take many times longer. Bonn. Escalation levels are not mirrored for the client and contractor, i.e. there is a different number of hierarchy levels. Problems are inevitable. A further problem unfortunately arises from frequent statements and implementation of “an internal project must also function without LA”. How is that supposed to work? I would like to conclude with the typical problems here. What 3 core messages should you take with you today? Feel free to contact me for active exchange.